Become VMware VCP6.5-DCV - Certified Stress-Free! You can now have the most efficient learning solution for VMware 2V0-622 exam preparation. If you're looking for real VMware 2V0-622 Questions & Answers, you have just found them in the revolutionary Train4sure Testing Engine. In a matter of minutes, you can download your learning solution, an interactive software that provides a realistic simulation of VMware 2V0-622 exam, all packed with latest, real and verified VMware 2V0-622 questions. Compiled by experienced VMware professionals and certified trainers, this learning tool provides you with everything you need to know to achieve ultimate success on your VMware 2V0-622 exam. The software lets you practice in a variety of learning and testing modes, you will be able to hide or show answers, or customize your learning solution in order to maximize the efficiency of your learning process. What's more, be sure to try FREE DEMO to get a sneak preview of this product before you purchase the full version. 231 real exam Questions & Answers from the real VMware 2V0-622 exam. Accurate answers and explanations (where available), approved by experienced VMware professionals. Free Demo - get a preview of Train4sure Testing Engine for the 2V0-622 exam. 90 days of free updates - learn with current exam questions. Flexible Testing Engine with variety of modes and features of convenient exam simulation. Feedback is welcome: Train4sure listens to customers' feedback and comments as we develop our products. Realistic simulation of the testing environment to help you get used to computer-based IT exams. Includes 383 Questions & Answers. Includes 191 Questions & Answers, 195 Study Guide PDF Pages. Includes 225 Questions & Answers, 757 Study Guide PDF Pages. to upgrade a valid VCP6-DCV certification by passing 2V0-622D. We are so confident in the quality of VMware products that we GUARANTEE that you'll pass your exams with our training materials. If not - we'll refund your money! Make every minute of your day count by studying on the go, no matter where you are. 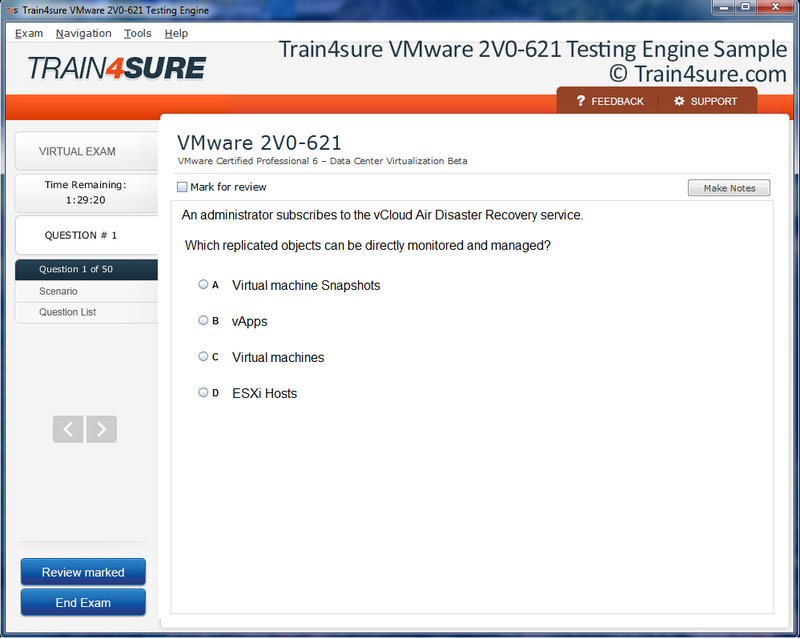 To make this easier for you, Train4sure offers the PDF version of 2V0-622 Questions & Answers. * PDF Version is an add-on to the main product (2V0-622 Questions & Answers) and cannot be purchased separately. Experience Train4sure VMware 2V0-622 practice test Q&A testing engine for yourself. To get a preview of VMware 2V0-622 Testing Engine with our free demo, all you need to do is type in your email address in the field below. * Kindly note: demo shows a few questions from VMware 2V0-622 exam, solely for the purpose of preview.